A well-established restaurant, offering delicious dishes and professional service. Minispa Sõstar of Pesa hotel awaits you to enjoy time with yourself and your friends. The minispa is open both for hotel guests and other visitors. We have set up the opening hours of the mini-spa, but these might change. In case there is more demand for that. We kindly ask you to bear in mind that the visiting time of our minispa is two hours. At a time, 12 people fit in into the minispa. Thus before arrival, we suggest you to check, if on that day there are places available in minispa. We suggest you to book the mini-spa visit beforehand at the administrator of our hotel (ph +372 5622 2881 or on e-mail broneering@kagureis.ee). Soon there will be a possibility to make bookings via our website, but not yet. What can you enjoy in our minispa? There are two saunas: Finnish sauna and aroma-steam sauna. There is jacuzzi and circular shower. In light therapy room there are Bioptron lamps, which heal even even safer than the sun does. While relaxing in light therapy room you may have some black currant tea. 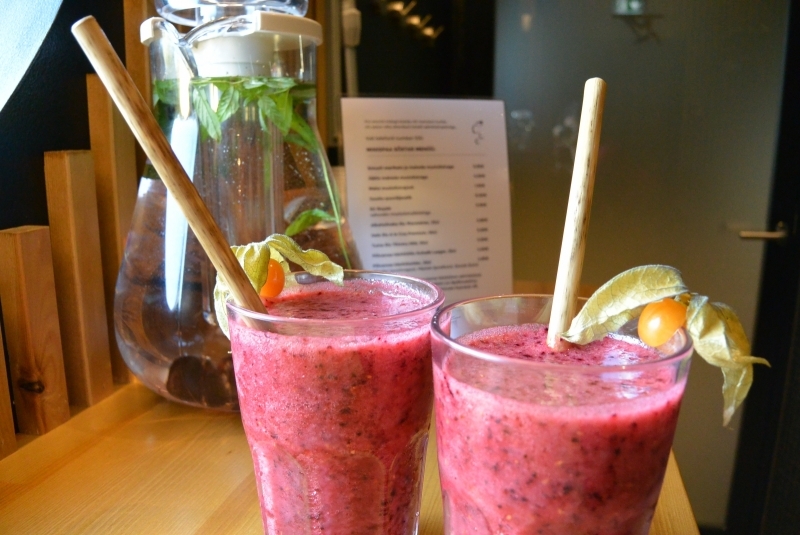 The black currant water is available nearby the jacuzzi. 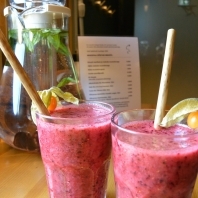 Some other drinks, like black currant drink or smoothie, may be ordered from minispa menu. Opening hours of minispa. For individual visitors the mini-spa is open from Monday till Friday 18:00 to 22:00 and on Saturday, Sunday 16:00 to 22:00. We count the visiting hours starting from full hours. Groups orders for mini-spa can be made for whatever time. Thus, it may happen that at some evening hours minispa is closed for individual visitors. Please call us beforehand and check the availability! Phone: +372 5622 2881. Before coming please read the good practises of our minispa. The light therapy room with Bioptron lamps is open for our minispa visitors. In case you wish to have the light therapy session without the spa visit, please book the time at our hotel administrator ph: +372 5622 2881 or e-mail broneering@kagureis.ee. Make yourself acquainted with the benefits of the Bioptron light therapy first. Children up to 4 yrs free of charge.